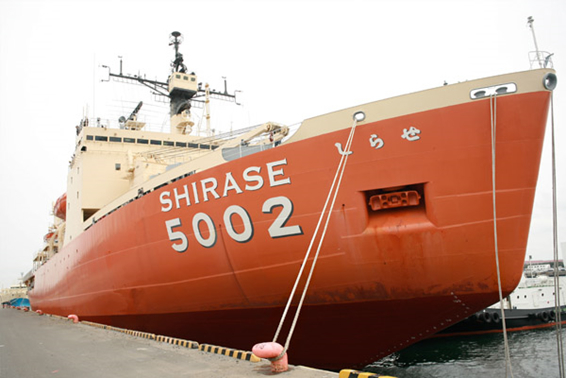 Ice-Breaker SHIRASE reborn as venue for Global Environmental Issues – Weathernews Inc.
Weathernews Inc. (Head Office: Minato Ward Tokyo. CEO: Chihito Kusabiraki) officially opened the decommissioned icebreaker, SHIRASE, to the general public today at Funabashi Harbor. After 25 years of making global contributions to environmental research as an observation vessel in the Antarctic, the vessel is reborn today as a symbolic venue for information sharing and co-creation of solutions for global issues. The vessel’s long history as an Antarctic exploration vessel has deepened our understanding of global warming. It’s rebirth as a center for communication and symbol of positive change is a continuation of its previous mission. In addition to being a place to share ideas for changes in our environment, it will become part of Weathernews’ communication and sensory infrastructure by monitoring changes in the environment like the polar ice caps. Weathernews hopes the vessel’s new role will broaden global knowledge of environmental issues through the participation and information sharing of the topics which affect all of us. As a publicly listed weather company, Weathernews is in a position to take an objective view of what’s happening to our planet. Weathernews has a history of developing global services that create value for their Supporters (customers) by working together with them to optimize their exposure to the weather around them. Over the last few years, many Supporters in the transportation industry and the general public have naturally expressed a widening interest in global climate change and other environmental issues. The weather-driven services established by Weathernews will provide the foundation for challenging these issues. It starts here and now on the SHIRASE. There are still many unknowns and unexplored areas of global climate and environmental change. Weathernews has reached the conclusion that what is required now is for nations, businesses and individuals to accept the need for total optimization by working together, participating in joint-projects and sharing information. By doing this, Weathernews aspires to overcome simplistic ideas of the past by connecting them to the future and moving on to practical co-creation of solutions. In its current incarnation as a symbol of ecological initiative, the SHIRASE will be a starting point for renewing our relationship with the environment. Japan is expected to lead the challenge of global emission reduction by 25%. Weathernews is hopeful that the SHIRASE will make a symbolic contribution to these environmentally conscious activities, and help to promote co-operation and information sharing leading to co-creation with our Supporters. The re-born SHIRASE is largely the same in appearance as it would have been during its 25 years of active service making contributions to our understanding of the global environment as an observation vessel in the Antarctic. The vessel’s observation rooms, pilothouse, captain’s chair, and plotting room are still as they were when she was operating at sea, so visitors can easily imagine what it was like when her crew were exploring and studying what is considered vital point of the Earth’s ecosphere. On board the virtually unchanged SHIRASE, we can imagine the environment the vessel left behind while also looking ahead to the future. The vessel’s mission will continue in a symbolic progression from monitoring environmental and climate changes, to information sharing and distribution, and hosting co-creation of solutions. When thinking about the issue of global climate change in our environment, the important first step is gaining an understanding of the current state and monitoring changes that are occurring. Here, the SHIRASE can continue function in the capacity as a center for observations, using the various sensors installed to pickup data in real-time. The pursuit of data on changes in weather and the environment will be molded by Weathernews into the critical key for success. Based on the data and subsequent understanding gained, Weathernews will put into practice global environmental monitoring for information sharing and co-creating solutions not only in Japan, but for the whole world. Weathernews’ Global Ice Center has been distributing information on ice conditions around the world, starting with the Arctic Ocean since 2008. The ultimate goal of the Global Ice Center is to help stop man-made global warming, exploit the effects of global warming as a way of slowing it down. To offer one example, the considerable reduction of ice in the Arctic Ocean over recent years has led to the discovery of a possible route passing through this region for commercial cargo vessels. When this Polar Route is fully realized, voyages that normally transit canals or capes can be made in only a third of the time, while fuel and CO2 emissions would also be significantly reduced. By means of worldwide monitoring and forecasting, Weathernews eventually hopes to provide a navigational support service for vessels sailing the Polar Route. Communication facilities of the Global Ice Center is located onboard the SHIRASE. Practical application of the Content we send out for this and our other services will help to cope with climate change and environmental issues. The Earth Center observes and measure vibrations and quaking anywhere from the bottom of Tokyo Bay to the other side of the world. A special sensor called the YURE (Yoo-ray) Station was developed in-house to measure the strength of vibrations, and is currently installed at over 1000 locations across Japan, including the SHIRASE. The time and strength of vibrations measured by each Yure Station is used to study their effect, and for other research applications. In the future, this will be used to develop yet uncharted areas like undersea earthquakes and the effects of earthquakes on a global scale. The results will be made public on the Earth Center website. Weathernews originally planned to launch its independently developed satellite, WNI-SAT 1, to measure the continuing reduction of ice levels in the Arctic Ocean due to global warming, and also to allow the participation of Supporters in monitoring, observing and evaluating C02 levels in the atmosphere. The SHIRASE is intended as a base of communications for WNI-SAT 1. The small-dish radar installed on the SHIRASE is capable of detecting phenomenon in the lower troposphere (below 2km) which standard radar cannot. Dubbed WITH Radar, it scans once every 6-seconds with a range of 50 km, allowing it to quickly measure the intensity of rain in Tokyo, as well as the speed and direction of its migration across the greater Tokyo metropolitan area. Observations of the abnormal high occurrence in recent years of wind gusts and the phenomenon known as “Guerilla Rain” can be used as content sent out and displayed on Weathernews website. With the Earth Sensing interactive multimedia globe aboard the SHIRASE, Supporters can monitor the state of the planet in real-time. Using the Earth Sensing globe to check actual cloud movements and areas of temperature increase across the planet, Supporters can experience the sensation of the current global weather data with their own hands. This creates an opportunity to consider the planetary environment starting with the Earth’s polar region. To achieve a deep understanding of global environment issues like climate change, there is first a need for liberation from scientific ignorance through one’s actions. The SHIRASE will be a place for sharing information about environmental issues like climate change and expanding knowledge that gives rise to specific actions. Through discussion, exhibition and sharing experiences, Weathernews will develop plans for action. Climate change in our global environment will be the theme of conferences, discussions and special events hosted onboard the SHIRASE for participants ranging from domestic to foreign, businesses and individuals, and even children. A “dojo” is traditionally a training hall for martial arts and meditation in Japan. The dojo onboard the SHIRASE was created with the aim of cultivating the spirit of environmental forecasting in children together with each other. Weathernews feels that concern by every child for the changes happening in the global environment will ultimately lead to a continuous symbolic progression, and mold the key to the solution. Along with seeing the current state of the planet with their own eyes and getting them to feel something about it, we want to give them a chance to think about it and eventually take action. In December 2009, the WNI Weather Culture Foundation was established to promote the practical use of weather-driven research in the Asia Pacific region for the goal of contributing to the advancement of “Weather Culture.” The Foundation will award recognition and assistance for research that contributes to the advancement of this goal, and develop it as the infrastructure for further co-creation and diffusion of weather information and Weather Culture. The first award ceremony will be hosted on the SHIRASE. In order to facilitate information sharing and co-creation between many people at the SHIRASE for environmental issues like climate change, the information and content developed there will be distributed through various media channels, starting with the internet. The merits of the network age will be maximized so that people who can’t actually be onboard can also participate and share in discussions of those themes. Weathernews is now responsible for the management, administration and operation of the SHIRASE. Together with the cooperation and participation of the national government, local municipalities and port management, as well as businesses, specialists, organizations and individuals concerned with climate change and environmental issues, the SHIRASE will be a shared venue for discussing solutions. Weathernews executive vice president, Jiro Miyabe now also serves as the SHIRASE’s Captain, with mountaineer Yoichiro Miura, who climbed Mt. Everest at age 75, as his first-officer. In October of 2008, Weathernews learned that after retirement from active service from contributing observation data of the Antarctica for Japan, the SHIRASE was to be scrapped. The vessel is a valuable Japanese asset, and plans were made to give her a second life as a “Symbol of Ecological Initiative.” Shortly thereafter, the market price of scrap iron fell considerably, and thanks to voices raised in favor of continuing her mission, Weathernews made another public appeal and successful bid to acquire the SHIRASE. How to Get Onboard the SHIRASE! If you want to visit the SHIRASE, please go to Weathernews’ SHIRASE homepage (http://shirase.info), and make a reservation. Visits to the vessel are FREE! *Reservations may be cancelled suddenly due to dangerous weather conditions. *Parking is not permitted on the harbor. Casual observers cannot board the vessel. Please be sure to wear unrestricting clothes and shoes appropriate to the vessel’s protrusions, ladders and cramped spaces. High heels, sandals and skirts are not recommended. Hard-hats are required and will be provided for visitors. Total time from the station and back will be approximately 2 hours.